You have a chance to discover the Apulian territory, a region full of character, tradtion and history. Combine our services and excursions with these guided tours of Apulia's fishing villages, white washed medieval towns of Cisternino and Ostuni and the well known caves of Castellana and UNESCO heritage site of Alberobello. A guided tour of Monopoli. This seaside town boasts a Carlo V castle by the sea, baroque basilica, fishing harbor and historical center. At the end of the tour you will board a boat from the harbor and explore Polignano a Mare. You will visit the sea caves with the historic center built above the sea on 24m high cliffs.You will get a different perspective of these seaside towns by viewing it from the Adriatic. In this guided tour, you will be visiting two major sights in Puglia. This tour includes a visit to the caves of Castellana, the largest karst in Italy and Alberobello, a UNESCO world heritage town consisting of trulli structures clustered together. The caves of Castellana Grotte extend for about three kilometers creating caves of great interest including the White Cave. 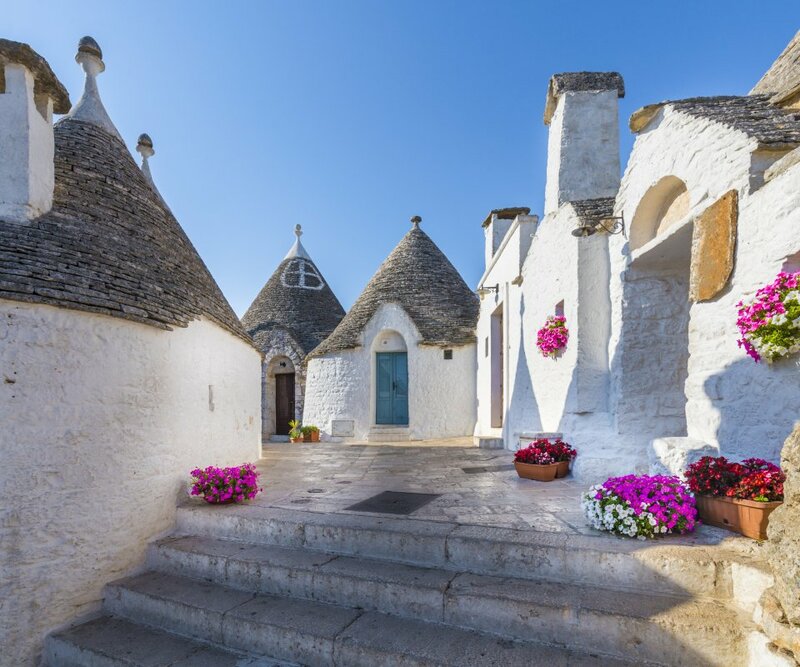 In Alberobello you will visit interesting sights such as the Trullo Maggiore (Major Trullo), the Trullo Siamese (Siamese Trullo) and the alleys leading to S. Antonio Church. On this guided tour you will discover two important towns in the Itria Valley. You will visit the quaint Italian village of Cisternino - with its white washed houses, small streets leading to picturesque squares and views of the Itria Valley on the perimeter of the town. After Cisternino, you will explore the medieval "white city" of Ostuni. There you will explore the Romanesque cathedral, beautiful streets that seem like a maze. Ostuni is perched up on a hill overlooking the valley with its ancient olive trees and the Adriatic Sea in the background.